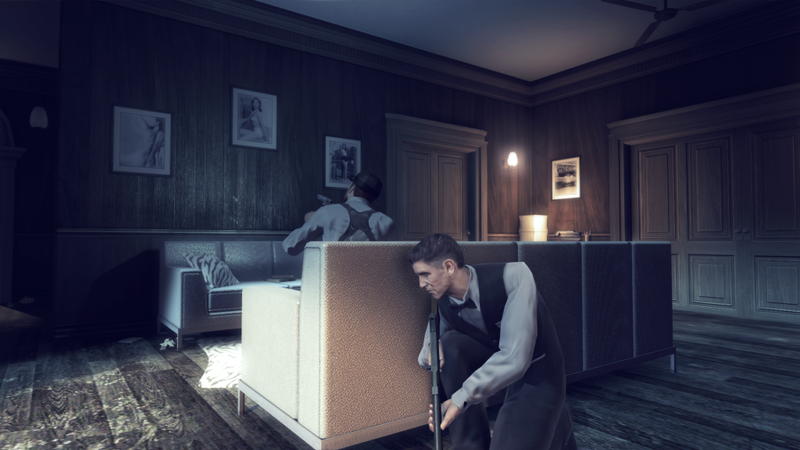 Alekhine’s Gun is a third person stealth action game, and it’s lineage can be trace back to the Death To Spies franchise. The game is published and developed by Maximum Games – who’ve taken the reins from Haggard Games. 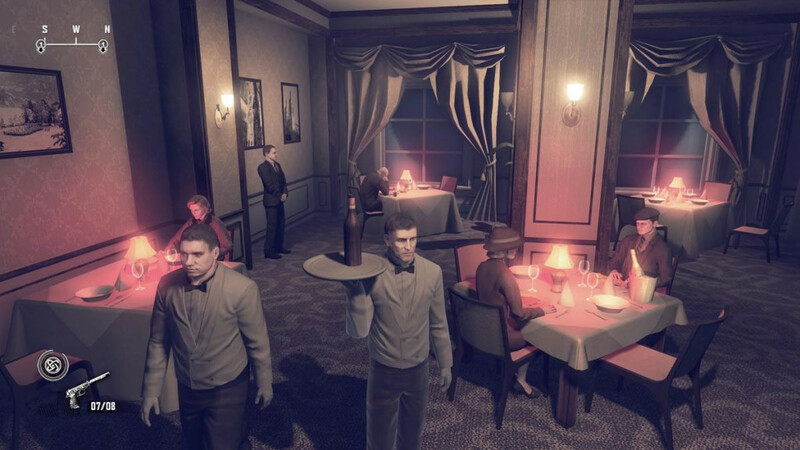 The game follows former KGB operative turned CIA agent Semyon Strogov (AKA Agent Alekhine) and the chain of events that led to his involvement in The Kennedy Assassination. 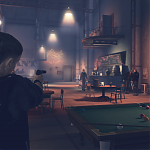 Apart from the main character’s codename, the game also draws its name from a move made famous by the Russian chess player Alexander Alekhine. Alekhine’s Gun opening focuses the rooftop suicide of CIA agent Vincent Rambaldi in Dallas, Texas on 22nd November 1963 – the day John F Kennedy was assassinated. 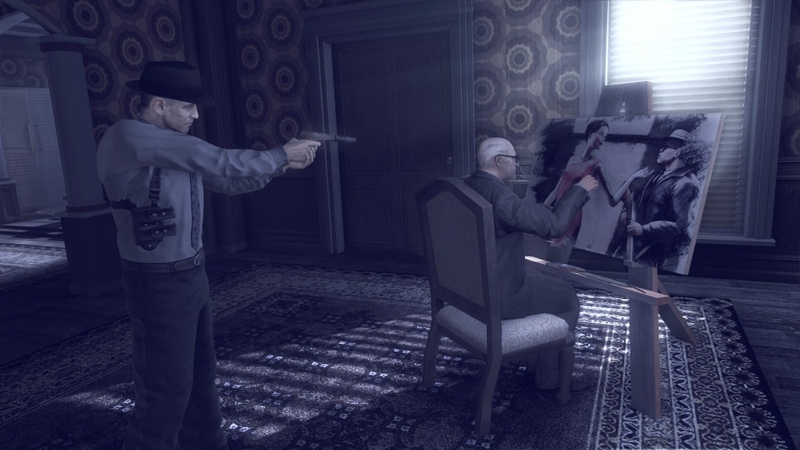 Cut scenes are static, noir style oil paintings – a strange choice for a current gen game. The scene then cuts to Strogov walking away from the scene of Rambaldi’s death, recalling the events that led him to this moment. 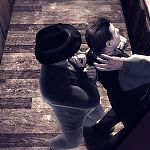 The game spans the Cold War, and all the major world events of the time – including the Bay Of Pigs Invasion, The Cuban Missile Crisis and of course the Kennedy Assassination itself. The game flashes back to Norway 1943, and a tutorial level. Your mission is to infiltrate a Nazi stronghold, assassinate two high-ranking Nazi officers and destroy an incriminating tape. The mission objectives are shown in depth, giving you all the information you need to complete these tasks. Tutorial boxes pop up as you progress through the level, including how to use the game’s instinct mode – showing enemy awareness levels and their positions relative to Strogov; how to quickly scroll through mission objectives and markers, how to sneak around, subdue and conceal the opposition’s forces. How you choose to complete your objectives is completely up to you – sneak around using garrottes and chloroform, setting up “accidents” or going in all guns blazing. 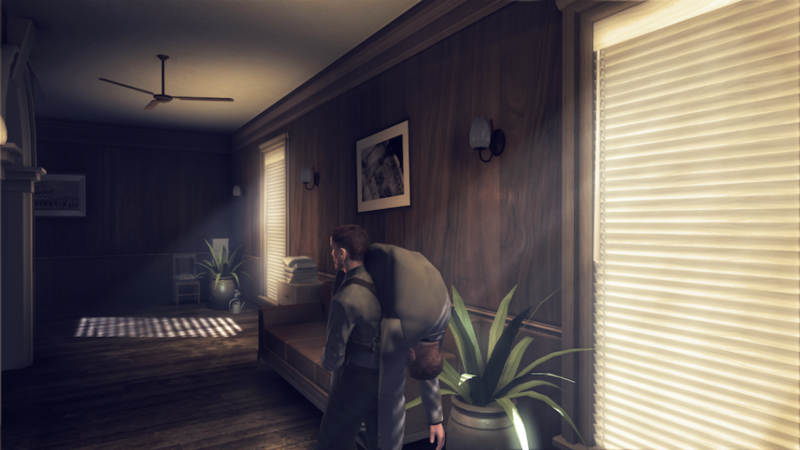 There’s a period of trial and error, as there always is with stealth games, figuring out patrol routes and such. 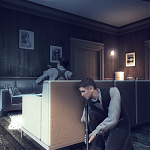 In Alekhine’s Gun patience is most definitely a virtue. 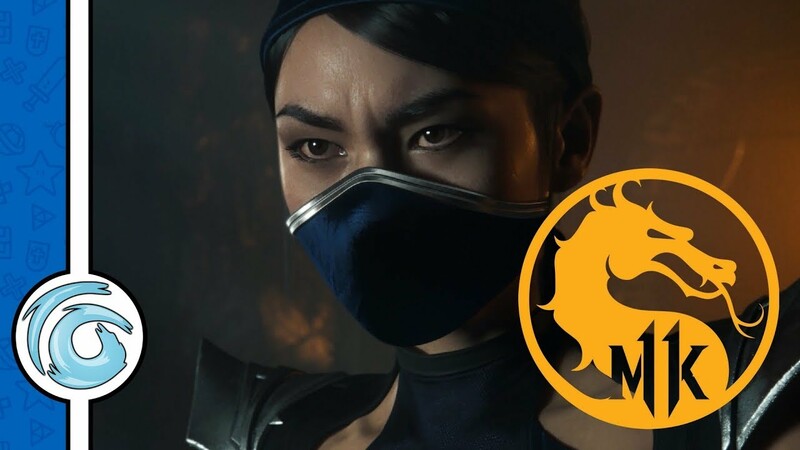 Enemies are twitchy, so it doesn’t take much to alert them – a lot of the time you’ll need to disguise yourself in order to avoid detection, which means taking down an unsuspecting enemy or two along the way. Be warned, once guards have been alerted to your presence, there’s no way to regain anonymity. Strogov can distract guards by drawing them away from their duties, either by whistling or flipping a light switch. This opens a window of opportunity to slip by unnoticed. Strogov can also subdue enemies, change into their clothes and conceal their bodies in conveniently placed nooks or cupboards. 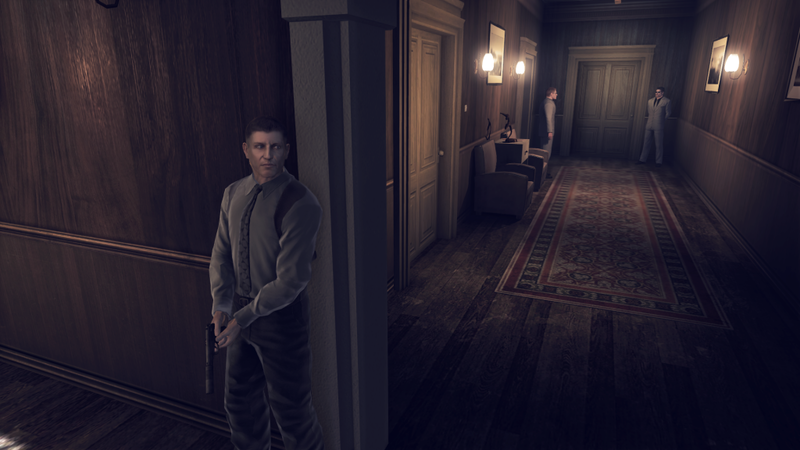 All standard stealth game tropes, although I did have an issue with the disguises – Strogov’s long weapon is still slung over his shoulder, which looks a bit odd dependent on the outfit – why would a surgeon be packing that kind of firepower? Should you come across a locked door that isn’t being guarded, you can pick the lock, which brings up a mini-game of sorts. The aim is to match the lock cylinder with the corresponding lock – although if you attempt this within the view of an NPC or enemy they’ll interrupt you, shooing you away and wagging their finger at you whilst tutting and shaking their head disapprovingly. After each mission, you receive an on screen debrief, listing stats such as how many times you were spotted and the number of bodies discovered. You’re also given a rank based on your level of stealth, from Ghost to Maniac. I attained the rank of Saboteur through the majority of the game, which I was pretty happy with. You also earn XP over the course of each level, which can then be used to upgrade weapons for forthcoming missions. Cut scenes bookend each mission, flashing forward to 1963, and Strogov’s debrief with his commanding officer. Strogov recounts the story, and you’re thrust into the next level. Voice acting is a little wooden, and as Strogov is Russian, he has a stereotypically thick Soviet accent. NPCs give the occasional grunt of astonishment, and enemies offer warnings in their native tongues. 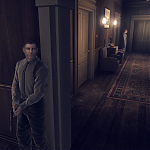 Graphically, Alekhine’s Gun is substandard when you consider that the game is a current gen only release. 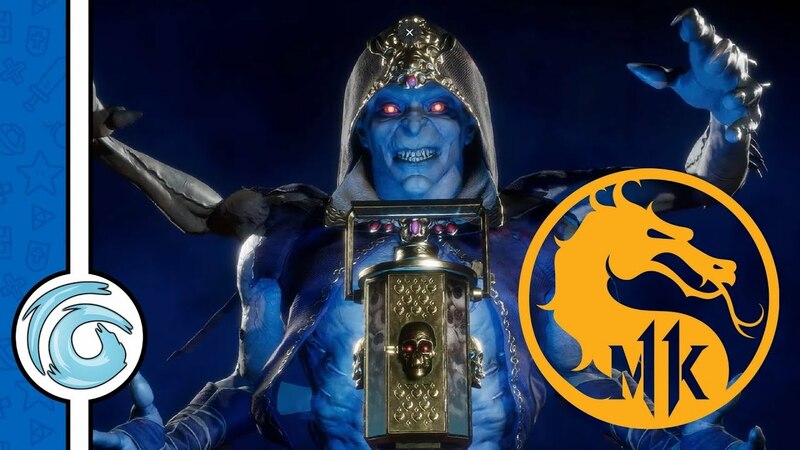 The graphics could be forgiven if this were a cross-generational release, but even by previous generation standards, they would be considered average at best. 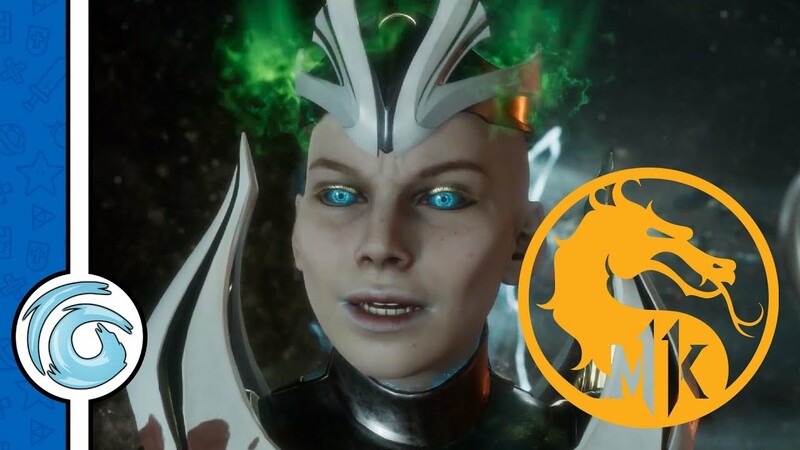 Character models and facial features seem stock standard and flat, and the lighting seems a little off – everything looks a little washed out and drab. I understand that this wasn’t the brightest era in world history, and maybe Maximum Games were hoping to reflect this. The game also suffers from some horrendous glitches – as I loaded the game for the first time, I noticed the frame rate dropped whilst Maximum Games’ logo appeared on screen; with load screens also suffering from the same problem. During gameplay I was able to walk through an NPC, and whilst discarding a body, it disappeared through a solid brick wall. There also some texture mapping issues – as I waited for an elevator’s doors to close I got a peek at the next floor through the half-closed doors. I’d like to be able to report that this is where the problems end, but the gameplay has its own set of flaws. Strogov has a sneak option, but whilst walking normally, there’s one speed, regardless of how far you push the thumbstick. There is a button to make Strogov run, but get spotted and you’ve blown your cover. This reduces you to a trudge around what can be relatively long distances from objective A to objective B.
Alekhine’s Gun can’t get something as basic as pouring a glass of wine correctly – on one mission I decided to poison one of my targets; having bumped off a waiter and stolen their uniform, I approached the mark’s table and pressed the appropriate button. I saw Strogov tip the bottle (nowhere near the glass itself), heard the sound of the wine being poured into a receptacle, yet no fluid came out of the bottle or filled the glass. If you do need to bring the noise, bringing a gun to bear is a pain – the crosshair doesn’t zero to the centre screen (something every other game in the genre manages easily). Strangely, the enemy doesn’t have this issue, as soon as they’re alerted they’re able to fire off a few rounds whilst you correct your aim to compensate. This pretty much negates the option to shoot whoever stands in the way of your objective, or your main target, as you’re guaranteed to go out in a blaze of glory as a consequence. Another odd decision is the lack of autosave, leaving you to save manually as you go. I discovered this to my dismay after being detected and killed halfway through a mission. I ended up saving after completing each mission objective, rather than having to retrace my steps if the same thing happened again. Better safe than sorry (and half an hour’s worth of replay to get to the same point). 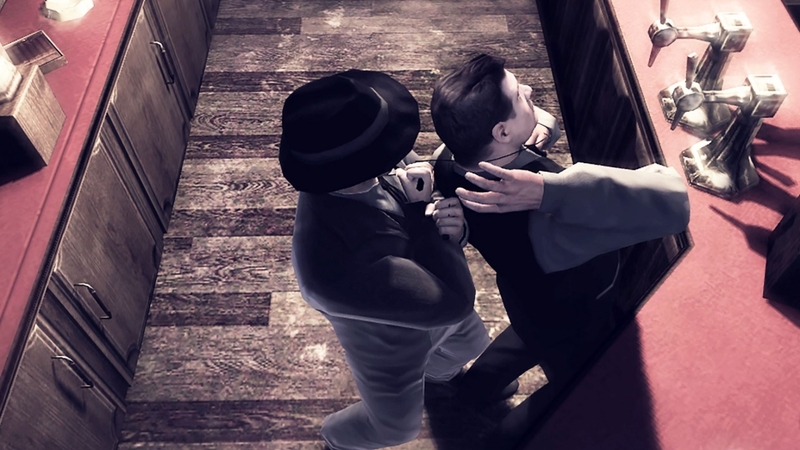 These faults are such a shame, I honestly had high hopes for Alekhine’s Gun, as it focuses on an underutilised and intriguing period of world history. I would’ve thought that the game’s bugs would’ve been caught in testing, especially due to the numerous release date slippages. 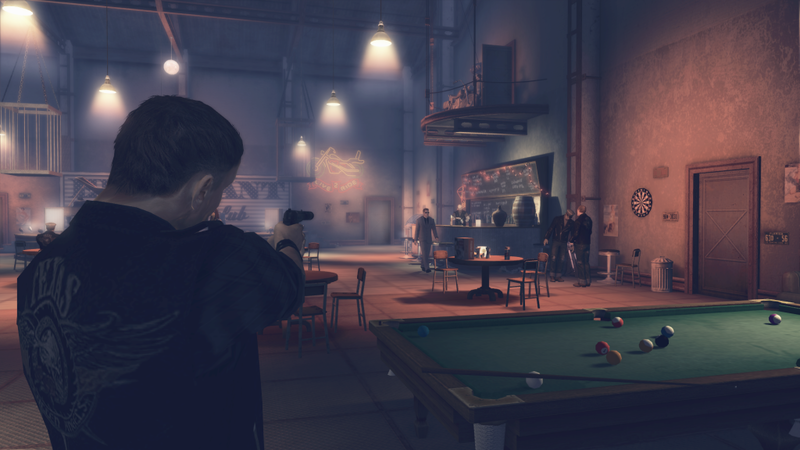 Alekhine’s Gun could’ve been enjoyable, regardless of the quality of the graphics and not having anything to separate it from other games in the genre – had it not been for all the glitches. Hopefully, Maximum Games will patch the glitches, in which case you could add another two or three points to the overall score below. Maximum Games should use Alekhine’s Gun as a lesson learned and come back with a stronger, more complete game next time around. 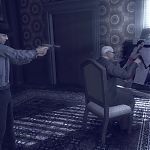 This review is based on playing the PlayStation 4 version of Alekhine's Gun that was kindly provided for review purposes by Maximum Games.